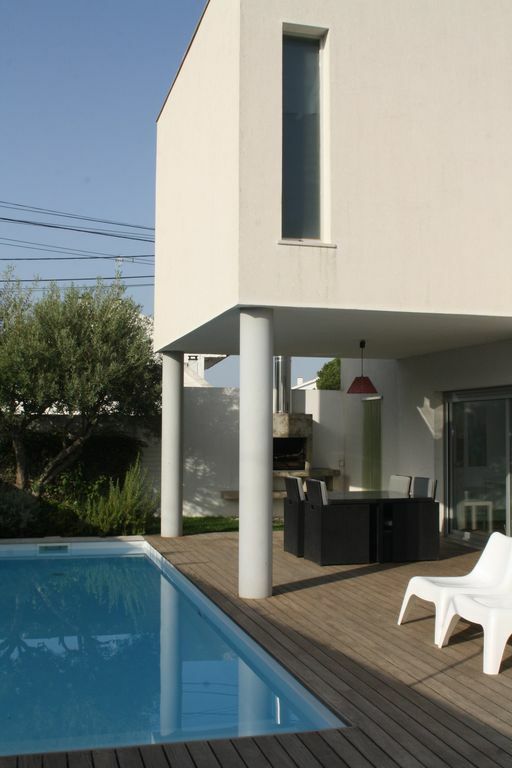 Modern 2 bedroom Villa (sleeps 2+4) with private pool and garden. 2 bathroom and amazing living room (sleeps 2) with fireplace and also a fully equipped kitchen. Near breathtaking Meco and Sesimbra beaches, ideal for Surf, Kite surf or windsurf lovers. Great night-life at Meco village center with outstanding restaurants with international and local food, fish and seafood specialties. Everything you need for a fantastic holiday! We love the Villa because of the fantastic facilities in the area. There are some beautiful beaches and a great range of bars and restaurants. There really is something for everyone here. The area is easily accessible with Lisbon airport less than 30 min drive away. The Villa is just 10 minutes walk from the fabulous beach. We provide beach towels and umbrellas so you can travel light and make the most of the great coastline. Excellent for those who enjoy a more active holiday: golf, surf, kite-surf, windsurf, diving,... We can recommend local caterers who can provide delicious meals at reasonable prices. All information available in a small book. Bathroom with bath/shower on first floor. One social bathroom on ground floor. One large couch (convertible into bed for 2), dining table for 8/10, LCD, DVD, sound system, wii console, fireplace, private pool and garden view. Central heating. Fully equipped with dishwasher machine, washing / drying machine, microwave, oven, refrigerator, Nespresso cofee machine, toaster and all other necessary accessories (dishes, glasses, cutlery). Quinta do Peru golf course at 15 minutes drive. Montado Golf Resort. Outside: Private pool, garden, terrace with furniture, barbecue. Cleaning / Towels / Linen / Maid service: Linen and towels weekly change. House maid once a week. Special cleaning schedules will be charged. Sehr schönes Haus, prima Pool, verschiedene Strände in der Nähe - und eine so freundliche Vermieterin! - Vielen Dank nochmal! La casa es tal y como en las fotos. Tiene de todo lo que puedas necesitar. Nosotros echamos en falta un exprimidor de naranjas, pero por lo demás está muy completa. Lo único que no me gustó mucho son los alrededores. La casa de al lado es como una granja y los gatos, perros y gallos hacen ruido de noche y es muy molesto para descansar. Por lo demás todo perfecto, Sofía nos ayudó en todo lo que necesitamos y fue muy amable con nosotros. We have stayed at sofia's house during 15 days and the experience was perfect. The house is like the pictures very peaceful place very close to Praia do meco BEACH. You have everything in the house is big enough to enjoy a nice holidays. Sofía is very kind AND try to help you during your stay. I will recomend this house to everyone who want to have a special time there. Beautiful and modern house. Credit for a pet-friendly environment. 25km of sea shore with breathtaking beaches. Costa da Caparica, Praia de Sesimbra, Praia do Meco, Portinho da Arrábida, Praia das Bicas, Praia do Rio de Prata, Praia da Foz, Lagoa de Albufeira and so on. 35 minutes drive from Lisbon Airport. Car hire is recommended. 35 minutes from Lisbon, 30 minutes from Setúba. 15 minutes from Sesimbra, 5 minutes drive / 15 minutes walk from other surrounding villages (Meco). Located 3 minutes walk from Alfarim village. 10 minutes walk to Meco beach. Bank, pharmacy, supermarket, fish / fruit market, butchery, newspaper stand, restaurants, coffees and all other necessary resources at a 5 minute walk. Booking Notes: 30% at reservation. 70% 15 days before checking in. Booking confirmed by email and payment done by bank transfer (IBAN) or other previously agreed procedure. Changeover Day: Flexible Check in after 15:00 Check out before 12:00.